Here are a few Spring Interview Questions for you! 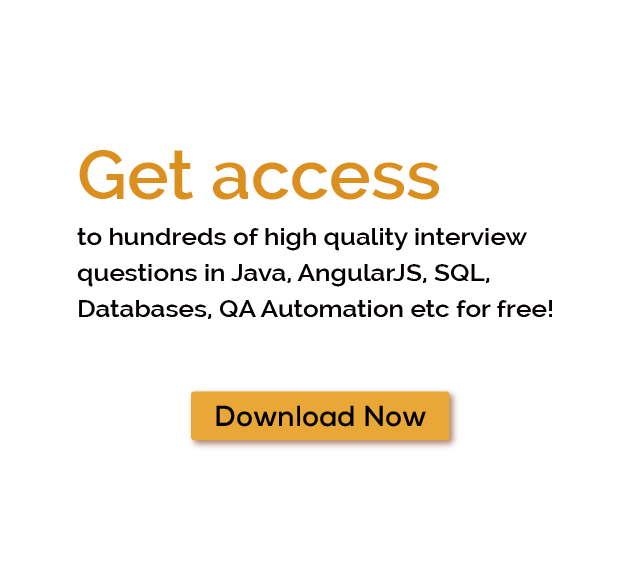 Download more High Quality Spring Interview Questions! Spring is one of the most popular application development framework for Java. Many developers around the globe are using Spring Framework to create application in order to achieve high performance and code reusability. Spring framework is an open source Java platformdeveloped by Rod Johnson, released under the Apache 2.0 license in June 2003. There are many online java spring tutorial available like spring javatpoint, java4s spring to learn and create basic spring applications. 1) Lightweight framework for application development. 2) Spring MVC framework can be used to create web applications and restful web services which can return XML or JSON response. 3) Dependency Injection or Inversion of Control to write components are independent of each other. 4) Spring IoC container manages Spring Bean life cycle and project related configurations like JNDI lookup. 5) Easy transaction management, JDBC operations, File uploading, Exception Handling. 6) Spring is also known for its modular approach. Even though the number of packages and classes are substantial, developer only have to include what they need and ignore the rest. 1) Reduces amount of code by initializing objects, open/close resources. JdbcTemplate class helps you in removing all the boiler-plate code that comes with JDBC programming. 2) We can quickly write a test configuration and inject mock beans for testing. Writing unit test cases are very easy in Spring framework since business logic doesn’t have any direct dependencies with actual resource implementation of classes. 3) Reducing direct dependencies between different components of the application, usually Spring IoC container is responsible for initializing resources or beans and inject them as dependencies. 4) Spring framework also supports java EE features. 5) Spring framework is divided into different modules, which helps us in keeping your application lightweight. If you don’t need Spring transaction management features, then no need to add that dependency to your project. What are the important features and benefits of Java Spring Framework? How do we implement DI in Spring Framework? What are different types of Spring Bean autowiring? Does Spring Bean provide thread safety? What are the best practices for Spring Framework? How to integrate Spring and Hibernate Frameworks? How to validate form data in Spring MVC Framework? Spring framework is the broad set of strategies that supports different kinds of enterprise applications without much efforts. Using the Spring framework, developer can write efficient, testable and versatile code for web as well as mobile platform like Android. Spring helps programmers to overcome many issues includes the idea of dependency injection or how various code modules depend on one another. Spring helps developer to correctly label and configure classes and code elements for efficient and accurate use. Spring also help with many other aspects of programming like job scheduling and authentication. Summary: Spring is an open source application development framework for Java. It is most widely used java based framework to create application in order to achieve high performance and code reusability. It supports web as well as mobile platforms. Some of the many Spring Interview Questions listed below will help you get an idea about what questions gets asked in such jobs related to Software Engineering & Tech. Get through the Spring Interview bar with our selected Spring Interview Questions for all Spring enthusiasts! For thousands of similar Spring Interview Questions login to our Website or download EduThrill. Experience the thrill of challenging people around the world on Spring Interview Questions!